Types of Wisconsin Truck Accident Injuries | Hupy and Abraham, S.C.
What Injuries Can Be Inflicted by a Wisconsin Truck Crash? Truck crashes can result in significant pain, emotional suffering, and financial hardship. However, not all of the injuries that occur in Wisconsin truck wrecks are the same. 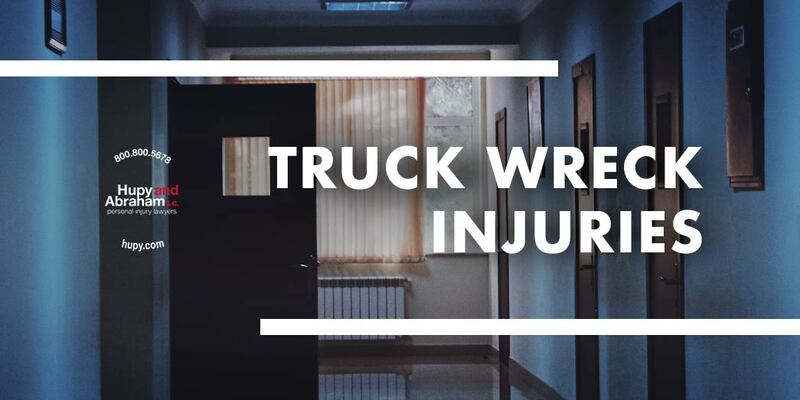 Below, we discuss the different types of injuries that you may suffer and why you should speak to a Wisconsin truck accident lawyer if you’ve been hurt in any of these ways. It is important to find out what can be done to safeguard your recovery now—before your time to take action expires. Brain injuries. A traumatic brain injury can occur if your head collides with your skull, if your head hits part of the car, or if an object penetrates the skull and punctures the brain. A traumatic brain injury can result in lasting changes for you. What those changes will be depends on the part of the brain that was hurt. Spinal cord injuries. A complete spinal cord injury can leave you paralyzed below the point of injury and the damage may be irreversible. The costs of a spinal cord injury can be staggering, since your medical needs and living expenses may be high and you may be unable to work due to your injury. Broken bones. Any bone can break in a crash. Your recovery depends both on the bone that broke and the complexity of the break. Some broken bones will heal relatively quickly with casting and medical care while others may result in long term pain or disability. Burns. A truck fire or combustible cargo can cause you to suffer significant burn injuries in a truck wreck. You may require hospitalizations, skin graft surgeries, pain medication and antibiotics in order to recover. Your recovery may be long and painful and, despite treatment, you may suffer from a lifelong disfigurement. Amputations. You may lose an arm, hand, finger, leg, foot, or toe at the scene of the accident or afterwards due to significant nerve damage or a severe infection. Learning to live without a limb or digit can be physically challenging and emotionally difficult. Respiratory injuries. Breathing problems or respiratory issues can occur if your lung collapses because of a truck accident injury or if you breathe in toxic fumes due to the hazardous cargo the truck was carrying. Death. Many of the injuries described above and others can result in death. If your loved one has died in a truck wreck, then you may have the right to file a wrongful death lawsuit and to recover damages for the irreparable harm that has been done. If your loved one has died or if you have suffered any of these injuries, then the time to take action is now. This is hopefully your first (and last) truck accident. Because you’ve never been in this situation before, you will find it difficult to understand all of the steps that you should take to make sure that your recovery is protected. You will need to file the right papers with the right court before the statute of limitations expires in order to protect you rights. However, you do not have to do this alone. Instead, you have the right to work with an experienced Wisconsin truck accident lawyer who will take care of all of the details for you. While you attend doctors’ appointments, make medical decisions, and manage your life as you suffer from the pain of an injury, an attorney can ensure that your rights are protected. For more information, please contact us online or call us directly at 800.800.5678 to schedule a free, no-obligation initial consultation.